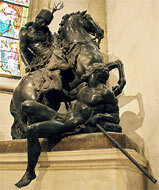 Famous Austrian sculptor Georg Raphael Donner (1693–1741) spent 11 years in Bratislava. 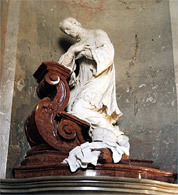 He came to Bratislava in 1728, when the primate of Hungary, Prince-Bishop Imrich Esterhazy called him to his court and commissioned him to carry out the statuary and sculptural decoration of the Chapel of St. Elemosynarius in the Dome of St. Martin in Bratislava. 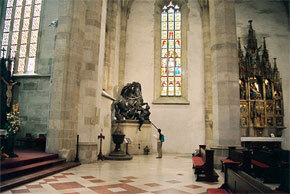 Donner carved the highly expressive kneeling figure of the primate in the Chapel of St. John Brother of Charity. After finishing the decoration of St. John's Chapel, consecrated on 28 October 1732, he created a sculptural group of St. Martin and the beggar, as well as statues of two adoring angels for the new high alter-erected in 1735. With these statues he came to a first peak in his oeuvre. In addition he was among the first in Central European plastic art to use lead. Sculptures made from lead represents a Roman soldier from Transdanubian Pannonia, who cuts his cape in two in a mighty movement of sabre to give half of it to a beggar suffering from cold. While living in Bratislava, Donner worked on numerous commissions in Vienna. Between 1737 and 1739 he created his most significant piece, the Providentia Fountain at Mehlmarkt (now Neuer Markt), which was commissioned by the City of Vienna.